This lesson plan is based on the visit of the wise men to see baby Jesus. First they come to see King Herod, but his dangerous plan fails and the infant Christ escapes to Egypt. 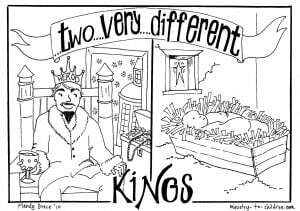 Children will learn how God protected the Holy family despite the wicked king. This lesson shows that God is in control, despite the pretenders like King Herod. Bible scholars are not certain as to when the Magi would have arrived at Bethlehem. Many suppose that Jesus could have been nearly 2 years old at this point, based on the age group Herod ordered to be killed. However, scripture is not specific. We are safe to say Jesus was still very young and without defense against the wicked King Herod – expect that God preserved him and his family. This lesson as first written for kids church, but you could modify it for use in any ministry context. Many other readers have already used it as the Bible lesson for the first Sunday after Christmas. Like all our materials, this printable lesson plan is 100% free to use in your church, home, or school. Learning Objectives: After this lesson Children will demonstrate knowledge of the people, places and events in Matthew 2 … by retelling the story in their own words. Marked Bible: Read Matthew 2. Prepare the copy in advance by highlighting the significant points to emphasize and underlining items that will need additional explanation. Poster board with map of New Testament period Israel. Map must include the cities of Jerusalem, Bethlehem, and Nazareth. It should also show the region of Galilee and the nation of Egypt. (This could also be done with a marker board or flannel graph.) Save this map for later lessons. Baby doll to use as Jesus in the play acting review. Explanation: Since Matthew 2 is information rich; this lesson aims mostly at teaching knowledge. In my children’s church the Gospel is emphasized in the singing, memory work and other elements outside the formal lesson time. If that is not the case, you will want to modify this lesson plan to include more Gospel. Show the children the map and the characters. Briefly introduce each person or place. Ask the children to listen carefully for how all these fit together in the story. Egypt – a far away country where Abraham’s family had been slaves. King Herod – the wicked King who was ruling the Hebrews from Jerusalem. Read (and summarize) Matthew 2. (Read with emotion and pause often to engage the children with the reading.) Make special note of the people and events listed above. Brief review: After the story, show the children the main characters and ask for volunteers to explain how they fit into the story. Review with map: Ask for children to come one-by-one to tell what happens next in the story by using the people and the map. Begin with all the characters in their starting locations. Let the children move the characters and tell what happened next. Act out the story: Call on 8 volunteers to act out the story. Identify areas of the room with the places in the story. Have all the children participate by asking them to direct the action by asking, “what happens next?” Direct the children to say or move to a different area as appropriate. Characters to include: King Herod, Four wise men, Joseph, Mary, baby doll (Jesus), Angel. thanks for this lesson it was a great help to me and I hope it impact my kids ministry. Tony Kummer (Editor) reviewed & updated this page on : January 9, 2019 at 8:41 am. All our content is peer reviewed by our readers, simply leave a comment on any post suggest an update.